Sunrise came with an important discovery today: the best way to get oneself out of bed. Simply accidentally drop your alarm clock in the laundry basket in your closet. The trick is to do it by accident, so you don’t spoil the surprise. You may want to enlist the assistance of a helpful roommate or significant other. When the alarm goes off in the morning, you will have no idea where the sound is coming from. Throw back the covers and look all around yourself in desperation and confusion. It won’t help if you utter a helpless and heavy “huh?” but it might make you feel better. Get out of bed and look on the floor. Under the bed. Behind the night stand. As the sound gets steadily louder and more frantic, you will finally isolate it to your closet. Root around in the dirty clothes, in the dark, because it hasn’t occurred to you to turn on the light. By the time you discover the source of the awful racket, you won’t care about getting back to bed. Your boiling blood will have woken you up completely, and you’ll just head downstairs to make coffee and feed the cat, who by now has also woken up. Mad, crazy turkey, or the link between dinosaurs and birds? 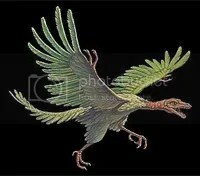 Last night I had a dream that I was stalking an archaeopteryx. This would be the long-extinct link between reptiles and birds. The “first bird,” if you will. I was crawling on my belly on a forest floor. After waiting for who knows how long, I looked up and saw it through a gap in the leafy canopy. Its flight followed a graceful arc, its wings beating effortlessly. I don’t think an archaeopteryx actually flew this way. It was not a bird as we know it. It was a reptile, much heavier than a bird. Its bones were not hollow. It glided, and it flew short distances like a bird, but it was not like an albatross or an eagle or a sparrow. The creature in my dream was beautiful, with a spectrum of feathers splayed out along its wings like a multicolored poker hand. It had fins of feathers on its head, too, like a gryphon. They looked like horns or ears. The head in real life would actually probably have been covered with something more like scales than feathers. And it would not have had horns. I remembered this after I woke, but during the dream I saw the creature as a normal specimen. It soon spotted me and began to approach. I remembered it was a carnivore and that I probably looked pretty tasty, but I didn’t know where I could run to avoid it. And anyway, this being a dream, I couldn’t move. The closer it got, the uglier it looked and the slower it moved. Soon it was just floating down, like the petal of a blossom or a piece of fluff from the laundry. When it reached the ground with a soft bounce, the creature looked nothing like it did when it was in the sky. It was brown, gray, withered, shabby. It looked like pieces were missing — its eyes, for one thing. It had no feathers. It was dried up. It was dead. But it was still moving. It was trying to communicate with me, but it made no sound. It just hopped and flapped impotently, thrashing around through the dead leaves. I had the impression that these movements were meant in a menacing way. It wanted to hurt me, but it was harmless. Then I became aware that there was someone else on the ground next to me. He or she was a companion. I knew that much, but I didn’t know who it was. This person was similarly dead and dried up in a gray, intact, zombie sort of way, able to move arms and legs but not apparently able to stand or walk or talk. Then I realized the archaeopteryx was communicating with — threatening, in fact — this dead friend. The corpse was scared of this creature, I could tell. And I realized that I was not. Rather than being startled by a partially mobile dead person, I was mainly annoyed that I couldn’t tell who it was. I stood up and ran away. I tore through the brush, forgetting where I had just come from. This gives me the willies. A friend of mine wrote an article about a bedbug infestation she — just barely — lived through. Their tiny brown legs never tickled as they scurried across my face while I slept. Their sharp mouths weren’t enough to make me flinch. I could imagine it, though, and that was enough. Each night, in bed, I waited wide-eyed for hours knowing they were homing in on the heat of my body and the escape of my breath. I protected most of my body with a long-sleeved shirt tucked into pajama bottoms tucked into socks. The slightest tingle upon my skin made me flick on the light, snap back the covers and begin the heart-pounding examination. Had they arrived? Eventually, pure exhaustion forced my eyes closed. And that was when I unwillingly became breakfast, lunch and dinner for the little body snackers. My face and neck got the worst of it. Are you scratching your neck yet? A Living Legend … Lives! All the way from the Lower East Side, where I work, to Midtown, I was singing, literally singing to myself (albeit under my breath). 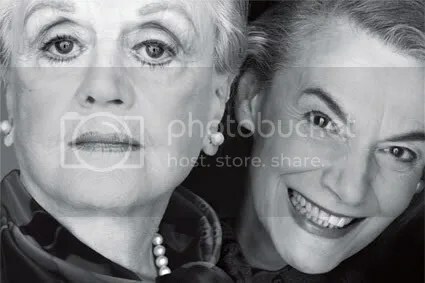 The day in question was Wednesday, April 18, the day for which I held one ticket to a preview performance of Deuce, a new Terrence McNally play starring Angela Lansbury and Marian Seldes. It was my breathless anticipation of Ms. Lansbury that inspired my internal musical monologue — “It’s Today,” from the 1966 Broadway production of Mame. I had been weak in the knees for months since receiving a postcard advertising the show. And this was the day. There she was on that glossy postcard with Seldes, a stark, black-and-white close-up, both women staring out at me, me, look at me! Lansbury, imperfect and utterly beautiful in heavy eyeliner, haughty and aloof, like a modern-day Marquise de Merteuil; Seldes looking severe, sharp and slightly manic, grinning like Cesar Romero as The Joker. Who could be sure if it was meant to suggest more about the characters or the actresses? Either way, it was instantly clear to me that I had to see the show. I was easily the youngest person at the shabby-but-cozy Music Box Theater. From the back row of the orchestra seats, I could survey every head in the audience: 70% gray; 20% bald. Sandwiched between an overdressed (and overperfumed) wife and husband in their late 50s, and a lone woman in her late 40s who spent the 15 minutes before the show reading Money Magazine, I felt conspicuous and a bit precocious. Lansbury and Seldes are two former doubles tennis stars, Leona Mullen and Midge Barker, respectively, who have reunited, after a long time apart, to make an appearance at a championship women’s tennis match. Between volleys (cue SFX — pok! … pok! … pok! — and swiveling heads) they reminisce about their successful career together, relive some ancient rivalries, rehash the history of the Women’s Tennis Association, complain a bit about the sponsorship deals of modern athletes, and talk a great deal about lesbians. Leona is brassy, potty-mouthed, experimental; Midge is disciplined, clean-cut, careful. This is not what the publicity photos seemed to suggest. I know little to nothing about tennis. I took lessons once, at age 15. I can serve a ball, but that’s about it. (Incidentally, I was the youngest person in that situation, too.) No matter. Half the reason (if not the whole reason) you go to see a show like this, with someone so huge in it, is precisely because she is so huge. The lights go down. The curtain goes up. The audience erupts into immediate applause. And the actresses, lit softly, slightly from behind, stand there stoic, patient, completely immobile, as if they’re not expecting the uproar, oh would you just stop clapping and let us get on with this, fortheloveofMike! And you feel the swell of a Moment — something Important. You are a part of … a Happening. History. The play itself is not so important. All I can think is: I … am in the same room … as Angela Lansbury. A voice comes over the speakers: “Quiet in the audience, please.” A tennis joke, I later learned. Professional players will ask for silence in the audience before attempting a serve, prompting a severe voice at the loudspeakers. Unfortunately, it felt forced and absurd and insincere to me. Ha ha, we know you know nothing about the show and you’re just clapping for these grandes dames of the stage! A built-in joke drawing too much attention to the actresses and taking us outside of the play. But it got a chuckle from the folks. It’s just the two of them — with the exception of occasional, contrasting cut-aways to the two obnoxious tennis announcers, and a brief visit from a fan with an autograph book — sitting there. Someone suggested it’s like My Dinner with Andre, without the dinner. Ultimately, the two friends let down their guard by and by, for maybe the first time in their lives, leading up to the revelation of a climactic truth. I confess: I’m guessing here. But I know there was some sort of revelation, because I woke up just as the echo of the clincher was fading away and a long, quiet moment overtook the audience. A woman whispered to her companion. People shifted in their seats. And I lifted my chin up off of my chest and cursed myself for falling asleep. As an intense wave of body heat coursed through me and I began to perspire a little, I could feel in the air that I’d just missed something essential. The one moment revealing McNally’s purpose had just passed. I totally blew it. Embarrassed and angry at myself, I could not let go of the moment all night. I re-enacted it discreetly on the subway ride back, letting my head droop slightly, over and over — this is what I did, this is what I did — as if to prove to myself that … well, you don’t have to be nodding off to look like this. Like … a total retard. I punished myself by trying to remember the last thing I heard before shutting down and the first thing I heard upon waking. I’m pretty sure it had something to do with a health-related revelation made by one of the characters half-way through the play, something you’d expect from a play about people in their mid-70s, but I won’t know now until I read the damn thing. For all I know, Midge revealed she’s a lesbian, or Leona revealed that she keeps her dead husband in the freezer in the basement. I find I have to read and see a play performed at least once, to really understand it, anyway. The actor’s interpretation reveals part, while the bare words on the page reveal something else. Maybe it’s a lack of imagination, a problem with attention span, my apparent narcolepsy. What did not escape my notice, however, was the sad central theme of the play. These two women are watching the match, talking, laughing, arguing, remembering. Living. Dying. They can watch the world move on without them. They’ve made a mark, paved the way, and their public appearance at the tournament proves they are remembered well. But even as they are revered by the autograph collector and the color commentators, they are also dismissed as passé. They are no longer necessary to the next generation, except in the past tense. They are the old guard, and they must pass on the torch as their own flames burn low and blue and ever dimmer. It’s clear to me why the audience demographic was so specific. I felt like I was listening in on a conversation at the adult table at Thanksgiving. It’s not so easy to separate the actors from the characters, after all. As a young person, to me this thematic notion of mortality is sad. But these women (the actresses and the characters), in contrast, have so much reason to celebrate. I can’t bear to think that they will not be here one day, because we love and admire them. But maybe, the closer they get to the finish line, it just feels more like an impending vacation and a well-earned rest. And so I’m for making hay. The way her mouth hung open and the way her eyes were just not quite shut, the little girl looked dead. She was obviously sleeping. If it were more serious, I imagine her mother, against whom she was leaning, would have displayed considerably more alarm. Instead, she herself looked half asleep and quite at peace with whatever state her daughter was in. It was early morning, and the poor thing had clearly not gotten enough sleep and was now sort of just passed out — hard asleep — on her mom. Ordinarily I’d think: “Cute!” But her dull, mannequin eyes peering out into empty space through the slits in her eyelids threw the picture off, like she was only imitating a human and there was just one little detail she couldn’t get right. I was careful not to let her mother see that I was staring at her face. Those eyes! They were like glass or plastic and did not move. Not even a jitter. They must have been taking in light, and surely they were recording something, but they were essentially switched off, like burned-out lamps. Every few minutes, a man on the other side of her, her father, I presume, poked her in the side in an evident attempt to wake her just enough to assume a more dignified pose. It wasn’t working, and he wasn’t trying very hard. A fat braid of hair came down from the side of her head, serving as a sort of cushion, framing her broad, smooth face against the shoulder of her mother’s jacket. She’s probably a nice-looking kid — when animated — I thought. I love that kind of heavy, total sleep, when your field of vision closes in on itself, the words on the page in front of you begin to say things that aren’t there, your eyes shut off before they are even closed, against your will, and your arms go slack, and your body slips at first, then plunges deep into unconsciousness. And how much sweeter it is to have someone to lean on. You abandon yourself with no care for your destination. Mom will wake me. You sink back until you’re enveloped in grey cotton. The storm of activity in your head dissipates. The last thing you read is carried forward into a sentence of nonsense and transmogrified into something fantastic that makes complete sense, an alternate, other sense, in that moment. When you wake up, you have a bitter taste in your mouth; you’re sweating from your scalp to your shoulders and down your spine; you have to teach yourself to move again, to lift your arm, to close your book, to stand, to step forward and off the train, and to climb the stairs toward home.